Welcome to the Talon Mailing & Marketing March 2014 Newsletter. The one-day program will be held in New York City. It will give attendees a basic overall knowledge of the relationship of postal regulations, mailpiece design, and related postage costs. The Association of Marketing Service Providers (AMSP), the National Association for Printing Leadership (NAPL), and the National Association of Quick Printers (NAQP) invite printers and mailers to attend a Postal Boot Camp in New York City on Thursday, March 20. AMSP, NAPL, and NAQP merged earlier this year to create a new association to serve the full-spectrum needs of the evolving graphic communications industry. Co-sponsored by the New York Chapter of AMSP (AMSPNY) and Printing Industries Alliance (PIA), the one-day program will be held from 8:30 a.m. to 4:30 p.m. at Club 101, 101 Park Avenue (between 40th and 41st Streets). It has been designed to give attendees a basic overall knowledge of the relationship of postal regulations, mailpiece design, and related postage costs. The sponsoring associations recognize and support the integration of the multi-functional aspects of services offered by today’s printers and mailers and believe this seminar will help companies that provide one or both services understand how direct mail can be produced and processed to meet USPS standards and regulations and achieve the most cost-effective results for their customers. Fee for the program is $150 for the first attendee and $125 for each additional attendee from the same firm. For more information or to register, contact Jim Prendergast at (212) 217-6824 or jwpdirect@gmail.com or call Kim Tuzzo at (716) 691-3211, or visit www.pialliance.org. In his book The Direct Mail Solution, direct marketing expert and entrepreneur Craig Simpson provides easy-to-follow solutions for creating direct mail campaigns that work! In this edited excerpt, the author reveals six different types of direct mail pieces you can choose from. There are many different formats and designs to choose from when planning a direct-mail campaign. Finding the right format for your offer, niche, and budget is critical to the success of your campaign. 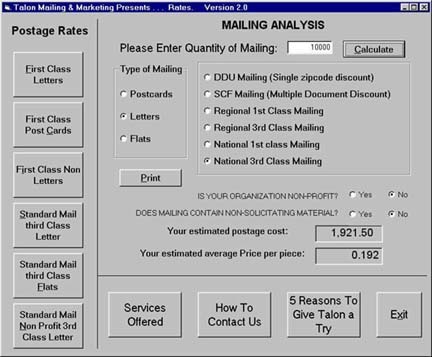 Below are some of the most popular mail formats. 1. Letter package. The most common format is a basic letter package. In general, the package would consist of a letter, an order card or form, a brochure, and the outer envelope. Sometimes, there's a lift note included. A lift note is a little note (perhaps 6 x 9 inches) that looks very personal--and may even be made to look as though it's been written out by hand on stationery. Some marketers do interesting things with the envelopes by making them look "official." They may put words on them like "Verified Mail" and "Confirmation Number." Or they may create a sense of urgency with words like "Express Letter Service," "Rush," and "High Priority Contents." These are all ways to make sure your package gets noticed and moved to the top of the pile. Slim Jim: This ranges in size from 6 x 10 to 61/8 x 111/2 inches. The J. Peterman catalog is famous for its use of the Slim Jim format. There's a quality of elegance to this size and shape. Magalog: The size is around 8 x 11 inches. It's floppy, full of color, and made to look like an actual magazine--but it's not. It's actually a sales letter. This is very commonly used in health supplement and nutritional marketing. Digest: It looks like a little booklet, kind of like Reader's Digest. The size is usually around 6 x 9 inches. This kind of piece is very appealing to people. It feels good in the hand and looks like it would be fun to read. 3. Postcard. Generally, the least expensive type of direct-mail format is a postcard. Postcards are like self-mailers but with a lot less sales copy. You get the benefit of the prospect seeing your sales copy right away instead of having to open an envelope. Your prospect can read the headline and see what the offer is at a glance. 4. CD mailers. This format is really a cross between a standard mail piece and dimensional mail. It mails flat, but when it's received, you can feel something lumpy inside. That's what helps get this mail package opened. The mailer should include a short letter or lift note and be personalized. But don't present the offer in the letter. If you do, the prospect will have no reason to listen to the CD and will completely miss the most powerful sales tool in the package. The CD mailer can deliver a powerful message. Not only do you get to connect with prospects through a letter, they also get to hear your voice and listen to your enthusiasm about whatever you are offering. Make it easy for prospects to respond by including a phone number or web address on the CD. 5. Dimensional mail. If you want to mail something that's really going to stand out in the mailbox, then dimensional mail is your best option. Use dimensional mail to get people's attention in hard-to-reach niches, such as medical professionals or business executives who have gatekeepers who screen their mail. Dimensional mail has a much higher opening rate than traditional direct mail, and it's easy to see why. A mail package with something lumpy inside will spark the curiosity of the person receiving it. Dimensional mail can be used very successfully by small businesses targeting a small customer file. If you're looking for a high response from 500 to 1,000 people and you can afford a higher mailing cost, then dimensional mail is definitely the way to go. It will get the customers' attention and get them to respond. 6. Shock-and-awe package. This marketing method is an elaborate package that you send to people who have specifically requested information about your products and services, and/or have already placed an order with you. The idea is to exceed their expectations, engage their interest, and build their loyalty--and perhaps even a sense of obligation to you--by sending them a package of materials and goodies that's unexpected and so impressive that it takes their breath away. These packages should include as many items, and as wide a variety of items, as possible. You want it to be exciting to go through and look like there's a lot going on there. Whatever you put in your package should be branded with your name and logo. You want the recipient to think of you every time he or she uses your mug, looks at your imprinted calendar or reads through the materials you sent. These packages can be expensive to put together. But they also can be one of the best ways to spend your marketing dollar. 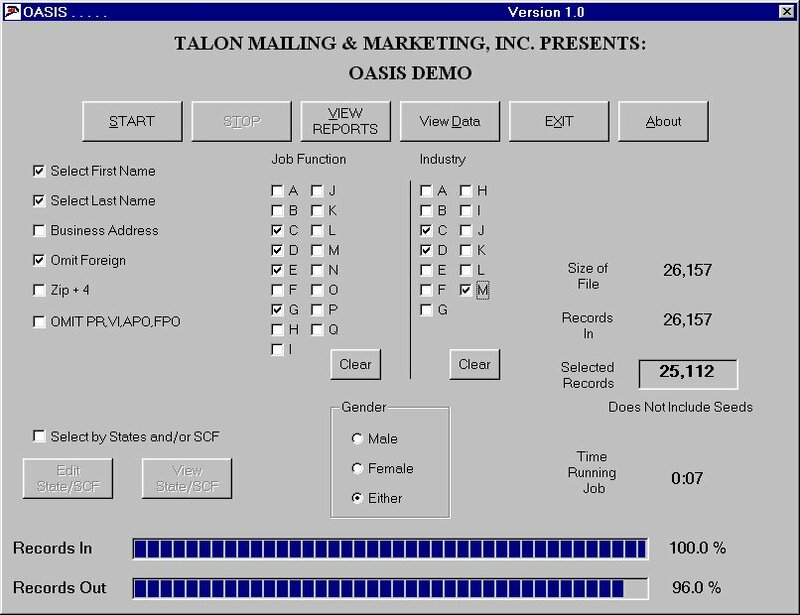 Designed and written by the Talon programming staff, this software is indispensable if you plan mailings, need to know the latest postal regulations, or require instant postage estimates. typeform.com - Create awesome web forms (optimized for mobile devices). grammarly.com - An automated proofreader and your personal grammar coach. Correct up to 10 times more mistakes than popular word processors. canva.com - Makes design simple for everyone. Create designs for Web or print: blog graphics, presentations, Facebook covers, flyers, posters, invitations and so much more. us.bidvoy.net - Bidvoy browses millions of eBay auctions and shows you the value of your item. collectorsweekly.com - Browse, research, and explore the world of antiques, vintage, memorabilia, and collecting. noexcuselist.com - Great site! The best place on the web to learn anything, free.